Global All-Terrain Vehicle Market size was worth at over USD 6 billion in 2016 and its demand is predicted to cross 1 million units by 2024. 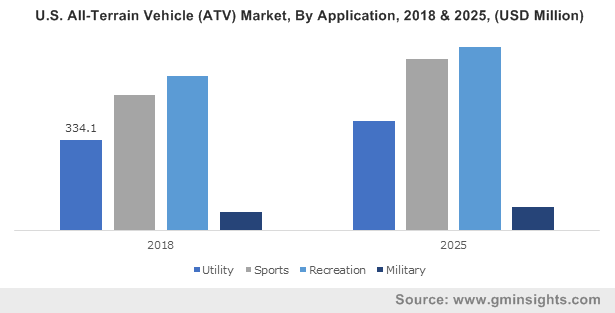 Growing penetration of recreational activities and sports across the globe will drive the all-terrain vehicle market size over the forecast timeframe. Advancements in infotainment system offer superior entertainment and user-friendly experience with GPS tracking, Bluetooth connectivity and mobile tracking facilities, thereby, enhancing driving experience. Rising technical development in quad bikes with upgraded performance and efficiency will boost all-terrain vehicle market size from 2017 to 2024. Large array of technologies along with independent suspensions, electric start and shaft drives offers enthusiasts with great riding exposure. Innovative infotainment systems keep the drivers informed, up-to-date, connected and entertained. Moreover, reduction in component manufacturing cost will minimize the overall product price and, thereby improving product sales. California based ATV Safety Institute endorses and regulates precise usage of these products with safety helmets, seatbelts and footrests arrangements. Regulatory guidelines regarding number of passengers permitted per vehicle and limitations for children below 16 years are few protocols directed to reduce fatalities and injuries. Several outdoor parks and recreational facilities provide riding as one of their amenities owing to increasing consumer demand for off-roading experiences. Profit margins in the overall all-terrain vehicle market are high owing to lower substitute availability. Technological expansions have led to competent product performance and ease in driving and thereby enhancing profit margins for several OEMs. Manufacturers gross profit margin ranges from 30%-35% while distributors’ margin varies from 15% to 20%. The net profit margin is a crucial factor that decides the scope of each industry players including manufacturers, component suppliers, retailers and online distributors. Increasing emphasis of industry participants on developing environmental friendly versions to eliminate excessive sound will propel all-terrain vehicle market share. The advent of hybrid models including hybrid diesels, will have positive impacts owing to their extremely fuel-efficient engines and minimal emissions. Furthermore, development of lightweight and efficient models for their implementation in military and defence sector for effective combat supplies movement is projected to fuel industry growth. However, rising negative environmental impacts on soil and vegetation hampers industry share. Shear forces of motorized quad bikes develop gullies and mud holes that alters hydrologic patterns and intensify erosion. Adverse effects of these quad bikes on environment may lead to prohibition of their usage in affected areas and may further hinder all-terrain vehicle market expansion during the forecast timeline. Utility segment in all-terrain vehicle market is anticipated to be valued at over USD 3 billion by 2024 due to increasing utilization of these products for various utilities particularly in military & special forces, agriculture and forestry. These quad bikes also provide higher performance, customization and high-power output. Several manufacturers have developed numerous models to cater to increasing product demand from various applications. Sport ATV demand was around 180 thousand units in 2016 and will pose a CAGR of more than 4% over the forecast period. This can be credited to its wide usage for recreational purposes due to increasing number of recreational parks and outdoor facilities providing adventurous driving activities. Manufacturers are offering factory warranty for products particularly used in sports applications. Advancements in drive system with high durability and superior performance for difficult trails are prime factors for increasing penetration. Youth segment accounted over 13% of overall all-terrain vehicle (ATV) market size in 2016. The segment growth is credited to growing product demand from all age groups and manufacturers focusing on providing vehicles for various sporting events focusing on kids and adults. Moreover, growing number of sports competitions coupled with stimulating popularity of youth-based segment among children above 6 years will boost industry share. Sports application is estimated to hold approximately 26% of the volume share and will witness a CAGR of over 5% by 2024 due to shifting consumer preference for recreational and adventurous sports backed by rising disposable income. Key manufacturers including Polaris and Honda offer a wide variety of sport segment that showcase light weight vehicle with required suspension to handle turns, jumps and bumps. These products are designed for different sports including recreation, hunting and racing. Large scope of customization to cater increasing consumer demand provides enhanced all-terrain vehicle market growth opportunities. Militarized quad bikes pose high growth rate as they can be easily transported inside numerous aircrafts including Boeing's MH-47, special operations helicopters, Bell Boeing, and Sikorsky's. They offer ground troops with mission flexible modular design, improved mobility, folding roll cage, greater payload and responsiveness. Full armoured quad bikes are used to provide protection from attacks. Furthermore, increasing military investments for specialized automotive by several countries will support all-terrain vehicle market penetration. North America is expected to account over 50% of the all-terrain vehicle market volume share in 2024 due to shifting trend toward extensive usage in several areas including agricultural lands, forestry and mountains. Rising adoption of off-road and recreational activities will positively impact the industry expansion. Numerous snowmobile associations and clubs across the region conduct sports events yearly, leading to increased sales of these quad bikes and thereby propelling industry size during the forecast timeframe. Asia Pacific all-terrain vehicle market registered over USD 730 million in 2016, owing to growing demand from military & defence and entertainment sectors. In addition, rising defence expenditure and increasing purchasing power parity is anticipated to positively support product penetration. The proliferating demand from various emerging economies including India and China will significantly contribute toward enhanced revenue generation. 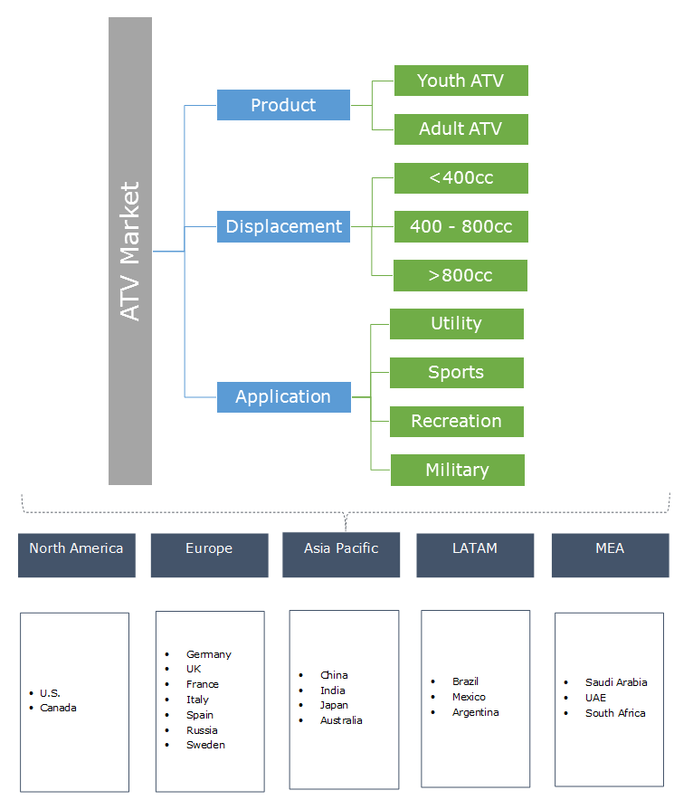 Global ATV market share is highly competitive due to presence of well established companies. Rising competition between new entrants and existing companies is projected to stimulate new product development during the forecast timespan. Manufacturers are expected to adopt several strategic approaches including collaborations, mergers & acquisitions and improved supply agreements to expand their customer base. Some of the major all-terrain vehicle market players includes Arctic Cat, Bombardier Recreational Products, CECTEK, CFmoto, Honda Motors, Kawasaki Motors Corporation, HiSun Motors, John Deere and KYMCO. Other prominent participants are Linhai, Suzuki Motor Corporation, Polaris Industries, Taiwan Golden Bee and Yamaha Motor. Several companies including Suzuki and KYMCO are focusing on young customer base and have lined up models suitable for young riders across kids and mid-size segments. This will positively offer potential opportunities for beginners and young drivers to enjoy adventurous rides. Furthermore, increasing adventure biking popularity among families, particularly women, is anticipated to propel product demand. Rising prominence of biking and racing sports through numerous topographies, including motocross, cross country, desert racing, ice racing, hill climbing, drag racing and flat track will enhance industry share. Increasing significance of racing clubs including Grand National Cross Country, National Motocross Championship and Championship Mud Racing across different regions is anticipated to stimulate all-terrain vehicle (ATV) market size. Historical data coverage: 2013 to 2016; Growth Projections: 2017 to 2024.